We build students, one robot at a time. We are the Cobalt Catalysts, FIRST Robotics Competition Team 3042 from Eastview High School. We are going strong with 38 active members. Starting this year, we have also added 28 FIRST Tech Challenge participants. 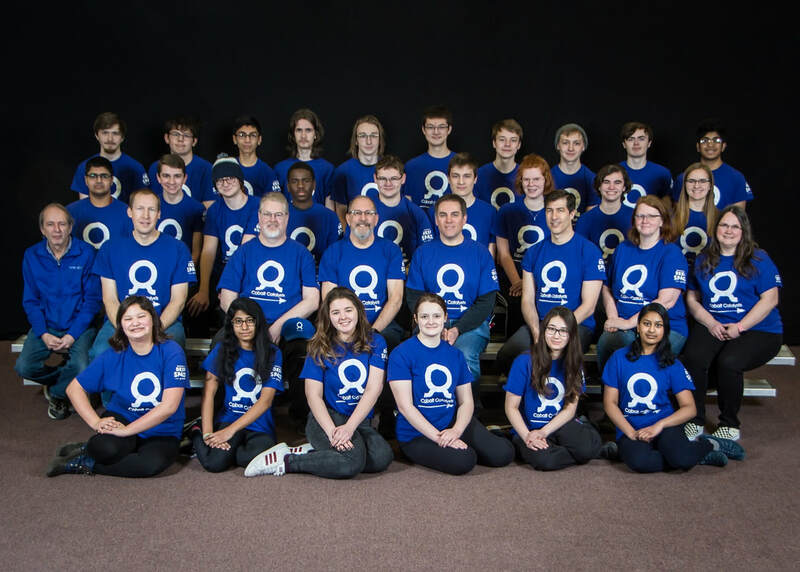 Eastview Lightning Robotics is determined to create a safe and encouraging environment in which students may learn and improve engineering and business skills to support their dreams and aspirations in and beyond their high school years. By learning hands-on life and technical skills, team members are preparing for the real world and the workforce, while forging lasting memories with friends. ​​Team 3042 introduces Twin Cities youth to STEAM (Science, Technology, Engineering, Art, and Math) and inspires excitement about it, providing a gateway to the STEAM community and an outlet for transforming ideas into tangible results. In the autumn of 2002, Eastview High School started competing in the HTK High School Robotics competition and had been actively competing in it until the program’s conclusion in 2008. That same year, Eastview decided to begin competing in the FIRST Robotics Competition. Almost all of the members from the original Lego League team joined the newly formed FIRST Robotics team. We focus on promoting teamwork through the many aspects that go into the competition like brainstorming ideas, the building and programming of the robot, and fundraising. Since our beginning we have sought to improve our team every year through student workshops, branching out our skillset and becoming more involved with the community. Our hard work and dedication has paid off these past few years as we have advanced to the FIRST Championships (worldwide FRC competition) three years in a row, and we won the Minnesota North Star Regional, allowing us to advance to the FIRST Championship in St. Louis, going (5-5-0) finally ranking 50th in the Curie Division; one of four divisions in the Championship each having 100 teams. The game was Aerial Assist. In the fall of 2014, we started our FIRST Tech Challenge teams with 28 Freshmen on three teams. Now there are four FIRST Tech Challenge teams of which will be competing in their fourth season next year. Cascade Effect.